The friends all meet up at the airport Vegas and with Billy off attending to his pre-wedding duties, the other 3 promptly hit the card tables. Archie seems intent on spending the remainder of his pension/super proceeds with some interesting results. There is long-standing tension between Paddy and Billy and this is heightened when they both seem to fall for Las Vegas lounge singer Diana (Steenburgen). Diana is a breath of fresh air. A wonderfully smart and beautiful woman who is leaving behind an unsatisfying life to follow her dreams. And she is age appropriate for our modern-day rat pack. Yes, yes YES!!! The foursome are comped into a VIP suite with their own private butler type person who can tend to their every need. It doesn’t take long before the hi-jinks start and they let their hair down and start partying like its 1975. 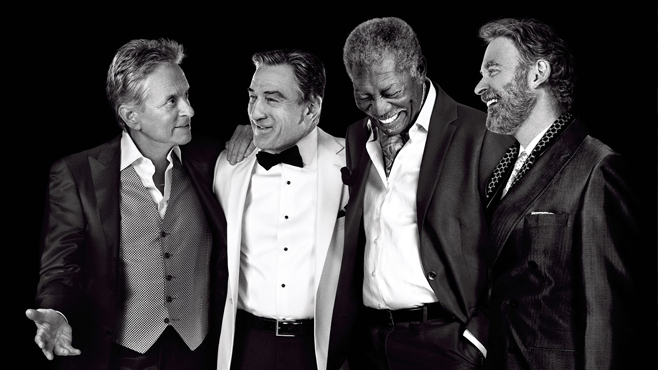 With these 4 mega stars as the leads in a movie about a bachelor party in Las Vegas, you would think you are onto a surefire winner. And it is funny and it does have it’s moments. But for all the talent on offer, the script lets them all down and that talent goes mostly to waste. The 4 are chosen as judges for a spring break type bikini competition. Now I have nothing against bikini competitions in Vegas but really…..they couldn’t have come up with something a little more intelligent and witty? You have 4 of the most respected and talented actors on the entire planet and all you can do is shove them on some chairs and have them judge scantily clad women. Give me a break…. When this movie nails it, it nails it perfectly. The deep and complicated relationships the 4 men share are believable and genuine. There are some truly great moments such as Archie trying a red bull vodka for the first time….. he aptly describes it as feeling like he is getting drunk and being electrocuted at the same time. Then he dances. Brilliant!